Rent. Lease. Sell. New. Used. Serving Southeast Texas and Louisiana. Buildings range in size from a small 8' x 8' guard house building, to a 12' X 60' office trailer, to a 24' x 64' double classroom building, to a 70' x 100' modular office building with restrooms, offices, conference rooms, coffee bars, etc. Contact us today! We are happy to answer all of your questions. Call or use our contact form to request an estimate. Whether your need is temporary or permanent Modular Teaching Space, Training Building or Administrative Offices we have you covered. We have new and used Portable Buildings from our rental fleet. 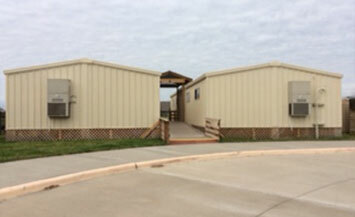 Modular Classroom solutions come in different sizes that range from Single Classroom, 2-Classroom (or Double Classroom) and 4-Classroom Buildings. We can supply both wood frame or steel frame construction for both commercial and industrial applications. The pre-finished 29 gauge steel siding and roofing material used is maintenance free. Whether you call it a Guard Shack, Security Station, Guard House or Security Booth, they are easy to relocate. 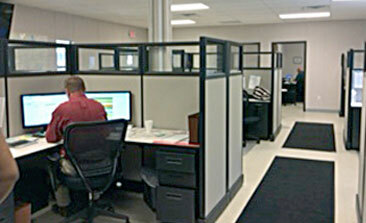 We can meet your needs from Portable Single Office Unit to a Modular Day Care Center Building. From Single Portable Classroom Buildings to Modular Classroom Complexes from Standard Buildings to Customized Classroom our Modular Space Solutions are available in all sizes and floor plans. We can rent, lease, sale both new and used equipment. Whether you need a Temporary Buildings (a T Building), an Annex Building, Mobile Modular Classroom or a Portable Classroom, give us a call. We sell and lease New and Used Mobile Office Units. 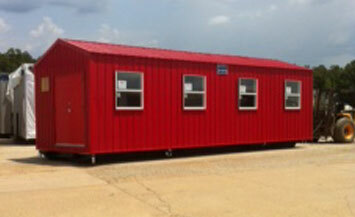 We have a rental fleet that includes Ground Level Offices and Storage Containers, Mobile Office and Storage Buildings, Construction Site Trailers and Jobsite Trailers, Locker Change Rooms, Breakrooms, Security Trailers, Portable Storage Units, Restroom Trailers, Shower Trailers, Modular Complexes, Classrooms and Double Classroom Buildings. We can help with Industrial Plant needs for Plant Shutdown Buildings & Plant Turnaround Buildings. 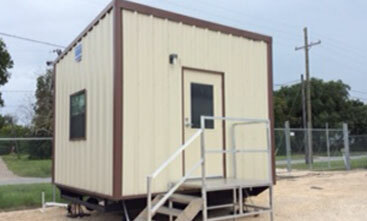 Included in our services are Project Management Offices, Restroom Trailers and Shower Trailers. We also have 8' x 20' open floor plan Portable Lunchroom Trailers, Portable Breakroom Trailers. We also offer large open floor plan Mobile Lunchrooms. Here you can view some of our projects at a glance. We provide permanent and temporary mobile, modular and portable buildings to the Houston, Texas Metro and Southeast Texas Areas. For more information or to get started with your new building, contact us today. 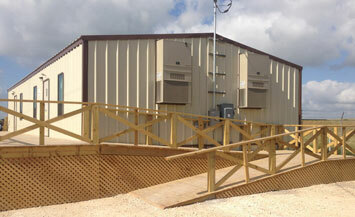 Portable Building: Guard House in Fort Bend County. 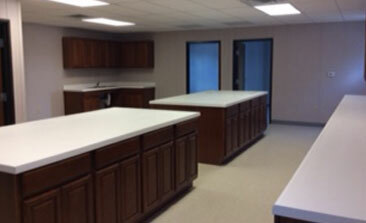 Lab Interior: Modular Lab Building in Mont Belvieu, TX. Work Stations within a Portable Office Building. 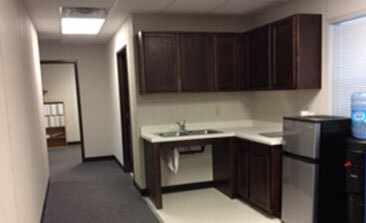 Kitchen/Breakroom in a Mobile Office Building. 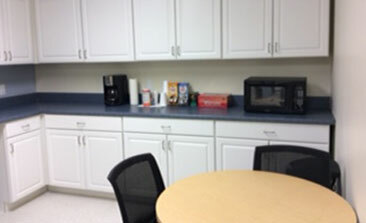 Coffee Bar/Common Area in a Modular Office Complex. 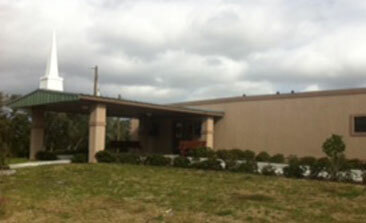 Exterior view of a Modular Church Building in Galveston County, Texas. Precision Structures, Inc, providing Modular and Mobile Buildings, temporary buildings and permanent buildings as well as storage containers to the Houston, Austin, Beaumont, San Antonio and Corpus Christi Metro Areas, Texas. We provide structures for Industrial, Commercial, Schools, Churches and the health care industries. Operating as Precision Structures, Inc. since September 1, 1998, our company history dates back to 1972. Precision Structures Inc, Serving Southeast Texas and Louisiana. Mobile Offices, Modular buildings, Temporary Offices, Classrooms, Guard house Buildings 6' x 6' and 8' x 8', Restroom trailers, shower trailers, Lunch room buildings, Storage Containers, Prefab metal steps with landings & ADA ramps. © Copyright 2016, All Rights Reserved. Precision Structures, Inc.